The Via Francigena is an ancient pilgrimage route dating back more than 1,000 years that connects Canterbury in southeast England with Rome. The trail was used by armies, traders, clergy, Catholics and many others making their way from every corner of Europe to Rome and then onto Jerusalem. In the Middle Ages, the Via Francigena was part of a network of pilgrimage roads that included the Camino de Santiago and connected Christianity’s three main cities of worship – Rome, Jerusalem and Santiago de Compostela in Spain’s northwest corner. Today the trail, much less developed and traveled than the Camino de Santiago, is trekked by a few intrepid pilgrims. 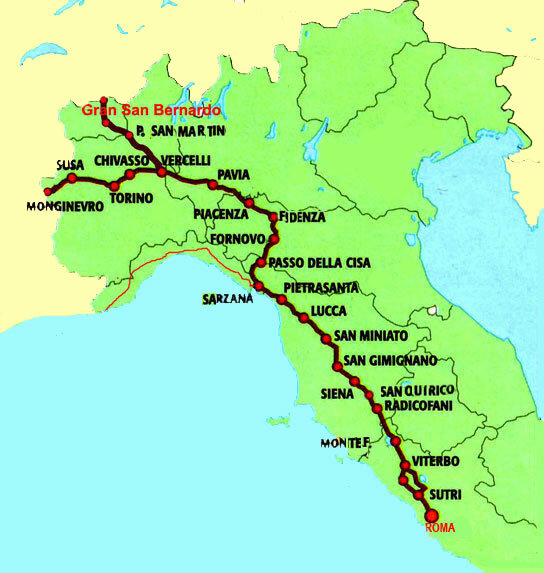 In 2007 I walked the Italian portion of the trail, 900 kilometers that start on the Swiss border then pass through Valle d’Aosta, Piedmont, Lombardy, Emilia-Romagna, Liguria, Tuscany and Lazio before arriving in Piazza San Pietro in Rome. Every day during the walk I updated a blog – walkforitaly.com – that is no longer with us (quite randomly the domain name is now owned by a Japanese company…I won’t hazard a guess to what they are selling). I continue to get requests from would-be-pilgrims for information so with that in mind I have decided to post (little by little) what I wrote for walkforitaly during my walk (I’ll be posting as I wrote it the first time around from the road, no editing, so please excuse typos as I was doing everything from a primitive smartphone, this was 2007 after all).